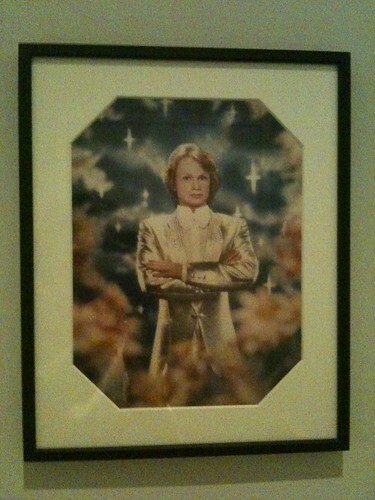 It’s been Visit Pam time in London these last few weeks. First it was my sister and brother-in-law (they of last week’s Full English Breakfast), then close on their heels came a quick stop by Rob H (frequent blog commenter) and travelling companion Wes. They were over to participate in the First Night Riders charity motorcycle ride in aid of The Theatrical Guild. (It may still not be too late to sponsor…). Before the ride started Rob and Wes had one night in London which they decided to spend having fancy cocktails and even fancier food, and just to make things even more fun (or at least more fun for ME) they invited your humble blogger along. As Rob said in his email, “There are 3 choices for most courses, so you see, we NEED you so we can just plain order everything.” I was happy to oblige, though I admit I was somewhat intimidated when I saw that the place we went – the Gauthier Soho – actually had a Michelin star. I was scheduled to meet the visitors after a full day of work, but had last-minute jitters about my wardrobe choice and almost decided to forgo the pre-dinner cocktails to allow time to get home and change into something more posh (not to imply that my wardrobe has a vast selection of “more posh”, but I did think I could muster something a bit more appropriate). Then I remembered who I’d be dining with, and what they’d likely be wearing, and I relaxed and hopped the bus towards Liverpool Street to find the first venue of the night, a fancy cocktail bar. Both the evening’s establishments had been exhaustively researched by Wes, the serious foodie in our midst. The cocktail place was called Lounge Bohemia (go ahead and click on that link and tell me if you can figure out how to get in…). It’s a place that specializes in a sort of molecular gastronomy style of cocktail making, meaning that while it’s possible to get a straight-up bottle of beer there, it’s much more fun to order something from the less traditional side. I tried a relatively tame combination of stout, raisin vodka and something else which was pleasant enough. Wes adventurously ordered some kind of tasting menu that purported to be a fresh take on old classics. When I arrived he was working on something that included a pile cotton candy made out of Amaretto (or possibly some other unlikely boozy ingredient) that he was twisting onto a swizzle stick and eating like, well, cotton candy. He also had a “White Russian”, which ended up being a small marshmallow infused with White Russian-ness served in a spoon of (I think) vodka. (Shades of “a single plum, floating in perfume, served in a man’s hat…). And then there was the margarita, which arrived as a pyramid of small salty bubbles called “salted air” and an aerosol container of margarita foam, leading to the quote of the night: “I hate it when you run out of salted air before you run out of margarita foam.” Rough life. And that was just the starters, we hadn’t even got to the restaurant yet. Despite our late arrival at the restaurant, we were surprised to discover that our table was not ready. We were also surprised to find out that the restaurant did not have a bar, or a waiting area, or even a corner in which to crouch, so the Maitre D’ actually asked us (admittedly with a certain amount of bowing and scraping) if we would mind wandering around the neighbourhood for fifteen minutes or so. 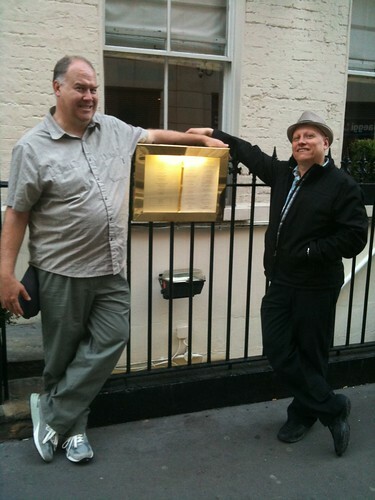 Instead, we hung around outside studying the menu and posing for photographs. Hungry Canadians, out on the street. Rob on the left, Wes on the right. Once we were in it was magic. Our table was in a small room all by itself, except for about a zillion bottles of wine lining the walls, which we all thought was auspicious, especially when Wes said, ”I was thinking we should start with a prosecco…” just as a waiter appeared with three glasses of prosecco. It was like the place was bugged. Or perhaps they just give everyone a glass of prosecco when they sit down, especially if they’ve been forced to loiter in the streets while waiting for a table. Whatever the reason, it was cool. After the prosecco came a few tiny amuse-bouche, one of which was actually a foie gras macaron, and one which was a sort of layered dip with breadsticks, and one ceviche thing. And there was the waiter who came in with a tray the size of a parking space covered in about eight different types of rolls and breads. And this was all before we’d even ordered. I tried sweetbreads! They were quite mild tasting, and not terribly organ-y at all. The consistency was more like lobster tail than anything. I also tried foie gras for the first time. Yes, I know it’s horrible for the goose involved, but I think trying it once is fair enough. In fact, I found it so rich that it was almost like slicing into a slab of butter so I’m not sure I actually need to have foie gras again. 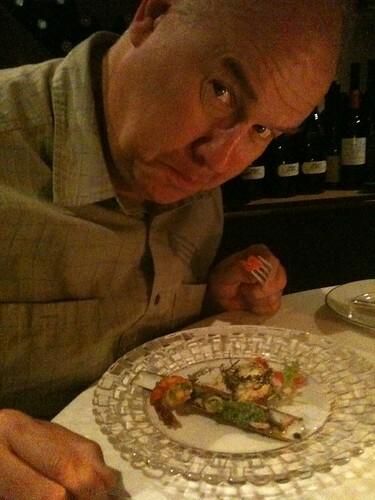 There was a seafood dish that featured smoked sea bass and a langoustine that was so sweet and tender that it made me make that sort of disbelieving “Are you kidding me?” face, and then slice off a small portion for Rob to try, who also promptly made the “Are you kidding me?” face. There was a lot of that going around all night. Rob, NOT demonstrating the “Are you kidding me?” face. I’m not sure what this face is, but he’s the one who kept exhorting me to put more pictures of people on the old blog, so he brought this on himself. The highlight, though, must have been when the waiters swooped in some time after the fourth course (pigeon), and the Maitre D’ introduced me to my new favourite word: PRE-DESSERT! How can it be that I’ve reached 42 years of age and never been privy to the concept of the pre-dessert? It’s so elegantly simple. I mean it’s clear that if one dessert is good, then two dessert must be double good, so why not simply slide in a bit of pre-dessert before the main event? It makes perfect sense. My first-ever pre-dessert was a sort of deconstructed cherry crumble with sour cherries in a warm sauce sprinkled with bits of spicy crumble. And that was before the dessert I’d actually ordered which was a chocolate thing (of course) that was so densely chocolatey that it was like a black hole of chocolate, which was then perched on top of a disc of crunchy praline. With gold leaf. I say that pre-dessert was the highlight, but really the whole evening was one big highlight. As Rob pointed out: we could have had a cracking night just hanging out in a pub eating fish & chips and enjoying the great company. Or we could have had an astounding meal with people who were annoying or stupid or just plain boring. Instead the food and the company were a perfect match, which raised the whole thing to another level. This meant that even though I had to be at work at 8:00 am the next day we lingered until the wait staff were hovering and trying not to get caught looking at their watches. We finally left some time after midnight and weaved through the West End towards Leicester Square tube station, where I ended up getting the last train home to Brixton and fell into bed in a state of perfect contentment. A truly excellent outing. The only other thing I can say is: Thank you Rob and thank you Wes, for coming over in the first place, and for making the time to visit with me, and for inviting me along for such a memorable evening. Come back again any time. Next time the first round of thymus is on me. Eggs - usually two and always fried. I have never been asked how I’d like my eggs when ordering a Full English. I suppose it’s theoretically possible to have scrambled eggs, but I wouldn’t want to be the one to ask. And poached? Well it just doesn’t seem to be in the right spirit at all. You might as well order the Vegetarian Full English which is a bastardization of the form I will not stoop to discuss here. Sausages – normally the standard breakfast sausage variety, unless you’re somewhere posh where they will be artisanal Cumberland sausages made from pigs raised on a diet of truffles and sparkling water or some such menu-speak rubbish. Bacon - it’s important to note that bacon in England is not like bacon at home. It definitely comes from a completely different part of the pig and is more like what we’d call back bacon or what Americans inexplicably call Canadian bacon. What we know of as bacon is here called “streaky bacon”. In fact bacon in general, and the incomparable bacon sandwich (or, more properly, bacon sarnie) might possibly warrant a separate blog post, since it seems to be an entire food group over here. Baked Beans – Yes, beans. 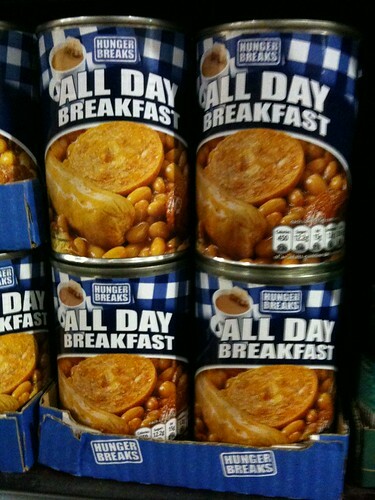 The kind that come in a can, traditionally with a blue label emblazoned with “Heinz”. They are an indispensable part of the Full English Breakfast and form a sort of puddle that the rest of the items nestle in/around. Toast – usually with a choice of white or whole wheat, buttered, normally served on a side plate, and never accompanied by anything so hospitable as a bit of jam or peanut butter. You can often get some kind of sweet spread on request but often it’s best just to use your toast to sop up the beans. Tea or coffee – In the case of a really traditional caf, the coffee will almost certainly be instant but is often served mixed with frothy milk that makes it quite tasty. The items listed above are the cornerstones of the Full English Breakfast, which can come in different proportions (fewer eggs, more sausages, etc…) but I think it’s fair to say that anything that doesn’t include all of the above doesn’t properly qualify as a Full English Breakfast. However, there are several additions that are not uncommon and worth mentioning. In fact, if your Full English didn’t come with at least one of these items in addition to the above list, I think you’d be well within your rights to sniff dismissively and mutter under your breath, in a properly English display of displeasure. Mushrooms – fried, of course. Plain button mushroom, sliced and fried up. Or in a more posh place, big whole mushroom caps. Tomatoes – fried, of course. Either slices of tomato, or a whole tomato cut in half. Sometimes put under the broiler (grill) instead of being fried. Fried Slice – bread, fried of course. I think it may actually be fried in the bacon fat. Or possibly deep-fried. I’ve only had it once, and that was enough. Bubble and Squeak – referred to simply as “bubble” by those in the know. Bubble and Squeak is a traditional dish in its own right, composed of leftover mashed potatoes mixed with leftover vegetables, most usually cooked cabbage. The variety at the Phoenix Café is an alarming shade of green, but really tasty. 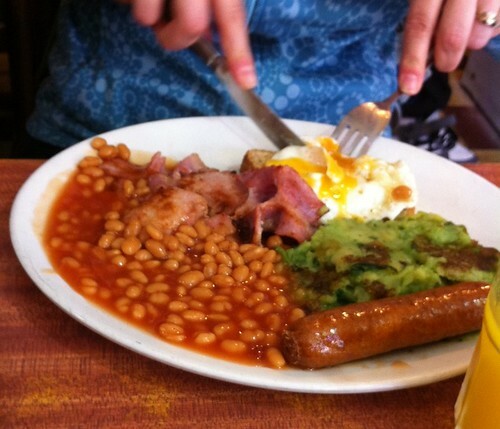 Bubble in a Full English is normally pan-fried. Of course. Black Pudding – fried, of course. And yes, it’s sausage made out of blood, but give it a chance! Black pudding is actually quite tasty and spicy, with a smooth-ish texture and a nice peppery kick. Served as a large round slice and fried (of course) so the outside is sort of crispy. Chips – Did you honestly think that the English would let a meal go by without the opportunity to eat chips? In addition the these variations there are regional differences that crop up when you cross a border. For instance, while black pudding is relatively uncommon in the Full English, the Full Scottish Breakfast would seem incomplete without it. White pudding also makes regular appearances in the Full Scottish. Regional bread products are also often encountered, such as soda bread or farl (fried - of course - potato bread) with the Full Irish, or tattie scones north of Hadrian’s wall. Apparently the Welsh even do some kind of pan-fried carbohydrate called laverbread which consists of “seaweed purée which is then mixed with oatmeal, formed into patties and fried in bacon fat” (of course). Ahhh, those wacky Welshmen. 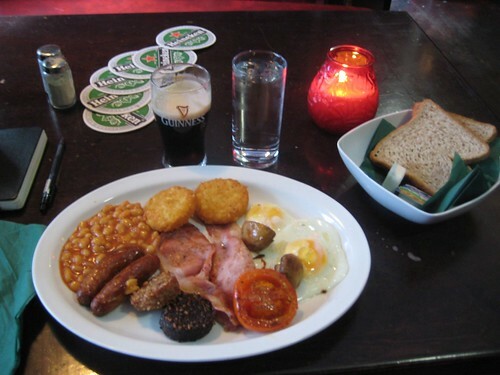 Pictured above is an Amsterdam Irish Pub/Hostel’s take on the Full Irish Breakfast, served to me on a bleary morning after an overnight train ride from Copenhagen. Black pudding is pictured in the foreground, with a very unusual appearance by tater-tot style hashbrowns at the top of the plate. And yes, that’s a half a pint of Guinness in the background. What can I say? It was a long night. The label says “Baked beans in tomato sauce with sausage, button mushrooms, chopped pork and egg nuggets with cereal and bacon.” Shudder. The entire contents of the can are meant to be tipped into a pot and heated gently (“Do not boil”, it says, as if to imply that over-heating will ruin the delicate nuances of flavour in the egg nuggets). But really, for the love of God, what is an egg nugget? And how can cereal possibly be included in the above list? Even I, primary participant in the Steve’s Weird Food project at my last blog, have not yet mustered the courage or intestinal fortitude to open that can. (Or perhaps I just haven't been hungover enough and house-bound enough at the same time). 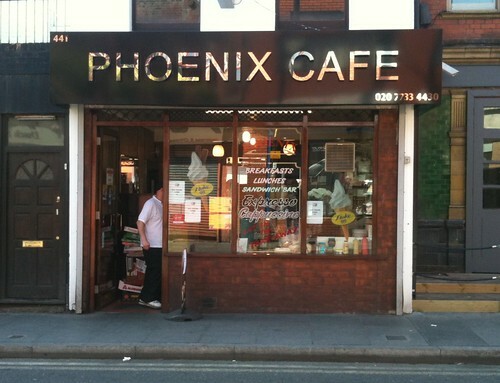 Because in the end, the Phoenix Cafe is just a short walk away and I am perfectly certain that they will never, ever serve me an egg nugget. Bad but unrepentant blogger – another two week gap between posts. This time my excuse was an eight day visit from my sister and brother-in-law which was most excellent, but the visit on top of the full time job left little time for blogging. So mea culpa once again, and let’s just move on. The Tate Modern is a modern art gallery located in the aforementioned South Bank area, right across the river from St. Paul’s Cathedral. It’s housed in the old Bankside Power Station, which was closed in 1981. The conversion of the building into a gallery started in 1996 and the finished building was opened in 2000. It is, according to Wikipedia, the most visited modern art gallery in the world, which surprised me until I realized this is likely due to the fact that, like so many of the great museums and galleries in London, admission to the Tate is free. Well, most of it is free. There are special exhibitions for which admission is charged, but if you just want to walk in and have a look at the permanent collection it’s completely free. As is the British Museum and the National Gallery and the Victoria and Albert and on and on and on. By contrast, the Museum of Modern Art in New York costs $20 to enter, so I guess it’s no wonder the Tate trumps MoMA’s admission stats. So there really was no reason for me NOT to spend a sunny late morning walking along the Thames taking in the sights and wending my way to the gallery, which is exactly what I did. The Tate’s permanent collection is displayed in four main areas and grouped into sort of themed areas - “Material Gestures”, “Poetry and Dream”, “Energy and Process”, and “States of Flux”. Whatever. I found these titles confusing and really unbearably arty, but I suppose they can be forgiven for the artiness part because, well, you know. 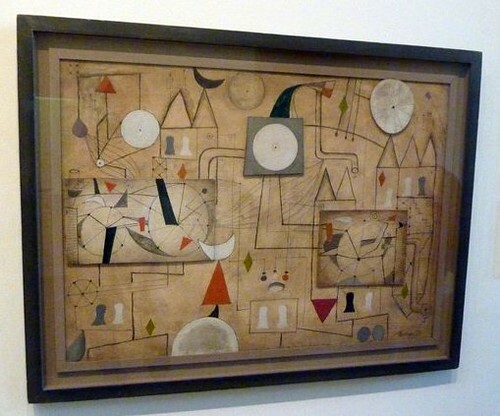 In any case, I selected the “Poetry and Dream” gallery, which is dedicated to Surrealism, and had a look around. And then what did I do? I left. I’d been there for an hour at most, and I just wanted a break. This is perhaps the most delicious thing about the combination of Living in London + Free Admission. I felt no compulsion to see it all in one afternoon, unlike when I was traveling and knew that the next day I might well be on another continent. It was really civilized. (Apologies JT, if this is simply rubbing salt into the wound…) So I wandered a bit further along the riverbank and stopped at a café and had a nice café au lait and a pain raisin and I sat and worked on the crossword. Thus fortified, I decided to give the Tate another go. This time I opted for the “Energy and Process” gallery, which turned out to be just excellent. The gallery focused on the Arte Povera style of modern art, which I can’t possibly be bothered to explain here. (If you’re actually interested, here’s the Wikipedia link.) In any case, those Arte Povera types did some really interesting stuff, largely in the way of big interesting sculpture / installation sort of things, many of which were made from found materials. I liked a lot of them, including this one called “Tree of 12 Metres” by Giuseppe Penone. It started life as a tree which was felled and sawn into a big square chunk of timber. 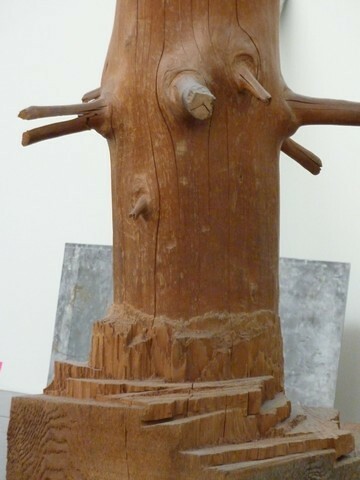 Then Giuseppe came along and used chisels to remove the squared off bits and find the tree shape that was still inside. This photo only shows part of one sculpture, but there were two, and, as the title suggest, they were up to about 12 metres high. I thought is was really clever. There was also a video installation by Igor and Svetlana Kopystiansky which I found utterly mesmerizing. Filmed over a two year period in Manhattan, it “traces the almost balletic movements of discarded remnants from an urban consumer culture. Projected on a large scale, these seemingly random and insignificant materials are transformed, taking on momentary sculptural or architectural quality before they move fleetingly out of the frame.” In other words, it was a 15 minute movie of garbage blowing around on city streets. It’s hard to describe, but it was charming and funny and I have to tell you that watching an empty foam clamshell that once held a double cheeseburger skitter around on the pavement is oddly absorbing. I watched the whole thing and I think there were moments when I laughed out loud. But I think the piece liked most that day was “Staircase III” by Do Ho Suh, also in the "Energy and Process” gallery. I took several photos of it (all up at the Flickr account) but I must have been so taken with it that I forgot to write down any details. Luckily, the internet is all-knowing and all I had to do was Google “red stairs tate modern” to be led to this excellent video of the piece at the Tate’s own website. How cool is this? Sadly, the people at the Tate did not offer to let me take “Staircase III” home, which is probably just as well, because even if Do Ho Suh made a specially dimensioned ceiling for the installation, it would still be somewhat challenging to live with the piece in a room that’s a mere 12’ x 13’. Finally I have to mention one piece that I didn’t get to see at the Tate, but the story of the which is too fascinating not to pass on. The largest exhibition space at the Tate is the Turbine Hall, which I presume once housed the turbines of the old power plant. It’s an enormous room - five stories high with more than 36,000 square feet of floor space. 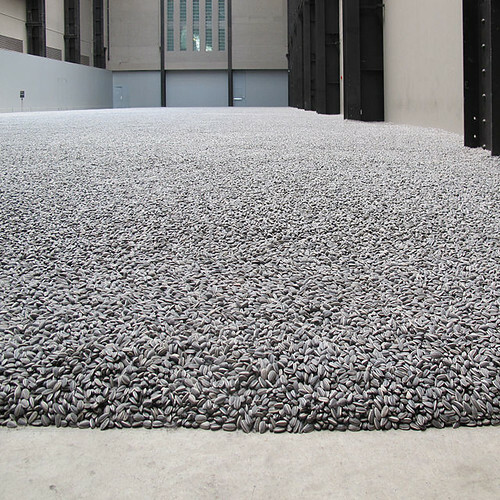 It’s used to display specially commissioned work, and the piece that was on display last fall was one called “Sunflower Seeds”, by Ai Weiwei. The work got a lot of media attention, and rightfully so, since it consisted of approximately 100 million porcelain sunflower seeds, each of which was painted by hand. The seeds filled the entire Turbine Hall to a depth of a about three or four inches and at first, gallery-goers were able to walk around on the seeds. You could feel them crunch under the feet and dig your hands down into them. Then, after just 48 hours, the Elfin Safety Police descended declaring that the fine porcelain dust produced when the seeds broke “could be damaging to health following repeated inhalation over a long period of time.” And the wankers closed down access to the exhibition, allowing viewing only from the side or from the gallery one floor up. Thus, a work of art made up of things smaller than your fingernail could only be viewed from twenty feet away. I tell you, it’s ‘ealth and safety gone mad. I missed it because I was too lazy to travel the 45 minutes down to the gallery last October during the two days while it was possible to actually interact with the piece. (In my defense it seemed like there was no rush, since the seeds were scheduled to be there until April.) However, there is an excellent video on a permanent loop in a viewing area near the Turbine Hall about the process of making all those sunflower seeds. It’s a fascinating film, showing how the raw materials were mined and refined in the traditional way in China. There are great shots of the enormous kilns used to fire the seeds. And it shows the small workshops in the city of Jingdezhen where hundreds of local women sat hunched over work tables for months (or possibly years) painting each sunflower seed individually. It’s a lovely little film. Sadly, the reason that it’s still being shown is as part of a protest by the Tate. This is because “On April 3, internationally acclaimed Chinese artist Ai Weiwei was detained at the Beijing airport while en route to Hong Kong, and his papers and computers were seized from his studio compound. Ai’s whereabouts remain unknown and due process under Chinese law has been denied him.” The Tate, along with other major galleries around the world have launched an online petition calling for his release. Details on the petition are here. And that was my afternoon at the Tate Modern: a little Surrealism, and little coffee break, a little sculpture and a little protest politics. All for free, except for the coffee and pastry, which was £3.34. And that’s a bargain no matter how you slice it.